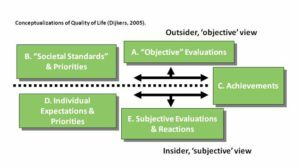 From Dijker’s (2003; 2005) perspective, the construct of quality of life (QoL) can be categorized into three major groups – which emerge from the interplay between the concepts illustrated below (Boxes A-E). Adapted, with permission, from Dijkers MP. Individualization in quality of life measurement: Instruments and approaches. Arch Phys Med Rehabil. 2003; 84 (4 Suppl 2): S3-14. Subjective Well-Being: Sum total of the cognitive and emotional reactions that people experience when they compare what they have and do in life with their aspirations, needs, and other expectations. Within this conceptualization, QoL may be expressed in terms of the discrepancy between an individual’s actual status (Box C) and what he/she desires or expects (Boxes D & E). Achievements: People’s possessions, relationships, accomplishments, etc (Box C). The major domains include employment and education, marriage and spousal relations, sexuality, other major social relations such as friendships, leisure activities, spirituality and religion, healthcare, equipment and accessibility, and personal caregivers. Utility: Preference-based health state valuations, which are often used in cost evaluations of health care. Within this framework, achievements and statuses (Box C) are judged in terms of societal norms and standards (Box B), and the resulting assessments reflect the desirability of value of the life across several domains (i.e., statuses, performances, possessions, relationships, etc. ), but the statuses typically reflect health aspects (mobility, sensory statuses, symptoms). Once evaluated, the preference for (desirability, ‘utility’ of) combinations of the factors of interest are rated on a scale from a value of 0.00 (death) to 1.00 (perfect) physical, mental, and social health (Box A). Measures of QoL can either be objective or subjective (or both). Objective dimensions refer to observable life conditions or physical functioning that can be operationalized by tests. Instruments used as ‘objective’ measures obtain an individual’s score on a profile or an index composed of multiple indicators of “the good things in life”, such as possessions or achievements. The values underlying the construction of the index generally are those of society or the investigators only and are not made explicit. The researcher’s assumptions and priorities determine what indicators are included, how they are weighted, and what the minimum scale points are. Subjective dimensions refer to a respondent’s perceptions. For some, QoL can only be determined by the person who lives it, and in this occurrence, is defined as being the reaction, either more cognitive or evaluative (life satisfaction) or affective (happiness, morale), to the congruence or discrepancy between a person’s standards, goals, values, and his/her actual situation, accomplishments, and so forth. Dijkers MP. Individualization in quality of life measurement: Instruments and approaches. Arch Phys Med Rehabil 2003;84:S3-S14. Dijkers MP. Quality of life of individuals with spinal cord injury: A review of conceptualization, measurement, and research findigs. J Rehabil Res Dev 2005;42:87-11. Calman KC. Quality of life in cancer patients – an hypothesis. J Med Ethics 1984;10:124-7. Moons P, Budts W, Geest SD. Critique on the conceptualisation of quality of life: A review and evaluation of different conceptual approaches. Int J Nurs Stud 2006;43:891-901. Browne JP, O’Boyle CA, McGee HM, McDonald NJ, Joyce CR. Development of a direct weighting procedure for quality of life domains. Qual Life Res 1997;6:301-9.